“Religion must mainly be a matter of principles only. It cannot be a matter of rules. The moment it degenerates into rules, it ceases to be a religion, as it kills responsibility which is an essence of the true religious act,” said Bhim Rao Ambedkar. 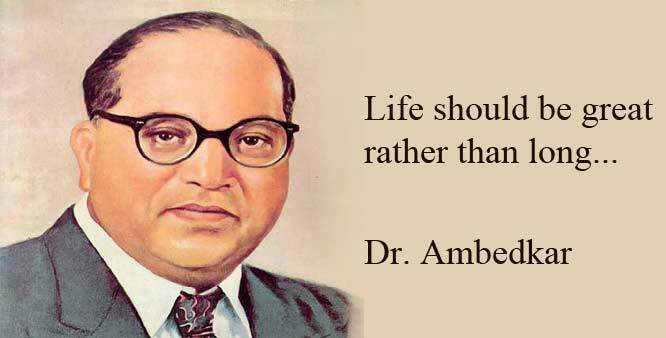 Mr. Bhim Rao Ambedkar is popularly known as Babasaheb Ambedkar. He is one of the popular faces and leaders of Independent India. the fact that we are remembering him on the occasion of our approaching Republic Day, that is, January 26th is that it was him who flagged the Indian Constitution. Here we are with a presentation of some of the best sayings by him that you can use as your whatsapp and Facebook status on the occasion of Republic Day. The reason why Broken Men only became Untouchables was because in addition to being Buddhists, they retained their habit of beef-eating, which gave additional ground for offence to the Brahmins to carry their new-found love and reverence to the cow to its logical conclusion. Caste may be bad. Caste may lead to conduct so gross as to be called man’s inhumanity to man. All the same, it must be recognized that the Hindus observe Caste not because they are inhuman or wrong-headed. They observe Caste because they are deeply religious. One can quite understand vegetarianism. One can quite understand meat-eating. But it is difficult to understand why a person who is a flesh-eater should object to one kind of flesh, namely cow’s flesh. This is an anomaly which call for explanation. All in all, these are the top 10 Popular Quotes By B.R. Ambedkar that you must read on the occasion of Republic Day.